Winter Storm Goliath put a kink in our plans to travel to Arizona for Across The Years. We'd been thinking we'd head south to New Mexico and then west along I-40, stopping to find a motel when needed a rest the first night, but this is where the storm was most severe. We decided instead to go on I-70 and then south through Utah, where the weather was to be clear. This was the way I had originally wanted to go, and camp overnight in Monument Valley. 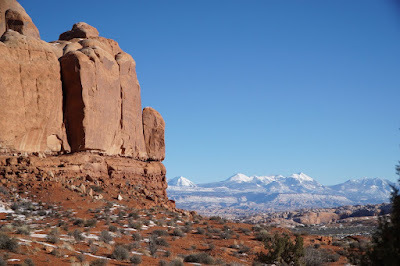 My desire to camp, however, became greatly diminished when I realized that it's 20 degrees in Monument Valley at this time of year, and that aside from the frigid campsites, the sparse motels in the region are touristy and very expensive. Given these options, our new plan became to haul through to Flagstaff in one day (12 hours of driving time, not including stops... and there would be lots of stops). The big, snowy, ski mountains on I-70 were beautiful. They gradually gave way to a drier brown landscape, still snow dusted, the farther west we went. Before I knew it, we were already 5 hours from home, pulling into Fruita to get some good luck wishes from Angela before we continued on our way. As we coasted in to Utah, Rob said, "You know, we're going to be driving right past Arches." In other words, we might as well stop. Hello, Utah. We meet again. Arches had been a bit of a sore subject for me ever since Rob got to go last February, when he was in Moab for the Red Hot 55K, and when we returned as a family over Memorial Day, an angry police officer had yelled at us (and everybody else in a long line of cars) for having the sheer audacity to attempt to visit a National Park on a busy holiday weekend. We were turned away. The park was full. So we stopped at Arches this time. No one yelled at us or turned us away. It was beautiful, but still sort of crowded (tourists not pictured above), and maybe not even quite as beautiful as Canyonlands--which had welcomed us with open arms last May when Arches wouldn't let us in. I don't know. Utah. It continues to mystify and amaze me. We got back on the road just before sunset, still with some 5 and a half hours to drive until we got to Flagstaff. Motel 6 had promised to keep the light on for us, though. "You know," Rob said, "Flagstaff is only like an hour away from the Grand Canyon." And I knew that meant we would be going there the next morning. Rob reminds me a little of my high school honors English teacher when it comes to the Grand Canyon. He loves the place. He visited it once when he was growing up, and it left quite an impression on him. He's spoken a few times about taking a family trip there, but we've never been. I've never seen it. And because of that, I can't completely understand what it's about or why he loves it so much or why, all those many years ago when my high school English teacher described it to the class, she choked up, had to put a hand to her face, look down and say, "Excuse me." All through high school, the upperclassmen had tried to scare us about senior year English, and in particular, how difficult it would be if we chose to take honors English. The subject was World Literature, and the material was abysmal and impossible to understand. More than that, they assured us that the teacher was mean. And hard. There were no survivors in that class. When I was a sophomore, for about 5 minutes I dated this guy who was a senior, and sometimes I would borrow his honors English textbook and read it. I got sucked in. These words of poetry and prose written by long dead people, these were the words I knew in my own heart. Dido's Epistle to Aeneas, Sappho's fragments (greener than the greenest green grass--I die!) and even the more modern Amy Lowell (Christ! What are patterns for?). There was no doubt in my mind that I would be taking honors English senior year. The upperclassmen were right, in a way. The class was difficult but rewarding, and the teacher was demanding, but you learned a lot. I don't know when we started doing it, but we called her Linda. Not to her face of course. Maybe it was to take the edge off. Make the whole honors English experience seem less overwhelming if we could pretend that our stern and exacting teacher was a person just like us, a person with whom we were on a first name basis. By the end of the school year, we were all bonded to each other in that particular way you become bonded with other people when you are pushing yourselves to the extreme. Boundaries had seemed to relax some. Linda even seemed less austere. 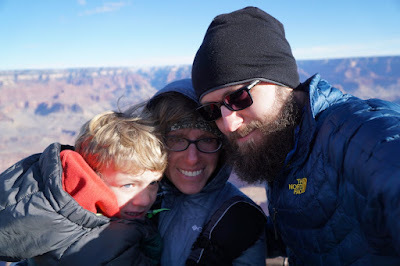 It was during this time that she shared the story of when she had been a young mother and visited the Grand Canyon with her husband and children. The rest of her family had been moderately impressed with the view. They thought it was neat. They looked around for a few minutes and then felt ready to move on. But Linda had been overcome with the magnitude of what she was staring down at. Geologic time over a mile deep, 18 miles wide, 277 miles long. It was enormous and as beautiful as it was bewildering. She couldn't speak or move. We all thought of her as cool and resolute, but here she was, in front of the classroom, her eyes filling up with tears just at the memory. It was catharsis, she said. Or maybe she didn't say that in so many words. Maybe we just knew that was what she had felt when staring down at the canyon. I've always remembered that. I've always remembered her and that class (which was the best class I've ever taken, even including college and grad school). And whenever anything has affected me so deeply, as it did that day for my English teacher, I've thought to myself, Linda's Grand Canyon. 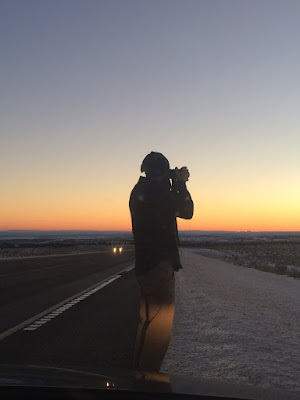 We got to Flagstaff late at night, after having driven through Monument Valley and the Navajo Nation in the dark. I hadn't seen a thing. I'd looked longingly out the window at the black shapes of the mesas against the blacker sky and hoped that someday I'd get to see these in the light of day. It reminded me of the first time Rob had taken me to Appalachia and we'd driven there in the dark, the huge mountains like ghosts all around us. I'd had no idea what they looked like until the next morning. Flagstaff surprised me too, once the sun came up. I'd thought all of Arizona was scrubby and full of cacti. But here there were beautiful snowy mountains and pine trees. Flagstaff had been on our list of Possible Places to Move when we'd had the chance to move anywhere in the world and chose Fort Collins. But I hadn't really known what Flagstaff was like. I hadn't given it a fair chance. Maybe I should have. As soon as we got ourselves up and moving in the morning, we left for the hour (more like hour and a half) drive to the Grand Canyon. We didn't have much time before we needed to head to Phoenix, so we only stopped at the visitor center on the South Rim. The parking lot was like Disney World (not like I've ever been, though) and the look-out point was so crowded with masses of tourists that I had to wait my turn, then elbow my way in, just to get a glimpse of what I was supposed to see. It was far from the transcendent experience Linda had described so many years ago. Oh, there it is. I guess. After taking a few photos, we went into the visitor center, where I bought a Grand Canyon refrigerator magnet, bumper sticker, and mouse pad. Because it seemed the thing to do. Then we got back in the car and drove to Phoenix. What Google Maps had estimated as 14 hour trip from home took us two entire days. I thought a lot about Linda's Grand Canyon on the rest of the drive and as we checked in to pick up our race packets for Across The Years. The Grand Canyon hadn't affected me like it had for her. Maybe I was more like the rest of her family, who had thought it was nice but then was ready to move on. And that's okay. 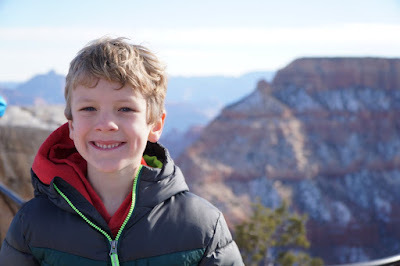 Linda's Grand Canyon didn't have to be catharsis for me. Plenty of other things have been my Grand Canyon throughout the years. The first time I climbed up to the waterfall in San Ramón. My last day in the forest when Wrinkle Belly came down low in the trees to say goodbye. Anytime I see the ocean. Canyonlands. In fact, the whole state of Utah might be my catharsis. I looked down at my bib number for Across The Years and thought, maybe I've been chasing that feeling all my life. I think they printed a surplus of bibs last year and then re-used them for 2015-16. "Plenty of other things have been my Grand Canyon throughout the years" - isn't that the truth? And sometimes places and things that no one else can understand. Sometimes the Lindas in our lives seem meaningless or trivial at the time, but plant seeds that grow into something spectacular down the road. Thanks for letting me part of your journey!